As many of you know, in December of 2016 at the age of 45, I made the hard decision to stop dying my hair. Thus began what felt like a very long process of transitioning to gray hair. I got my first gray hair in my twenties and have dyed it myself ever since. When I made the decision to transition I knew I was gray but I really didn’t know the extent of it since for the past twenty plus years I’d only ever seen my roots. It got to the point where I was having to dye my hair every four weeks just to keep on top of the gray. I hated this monthly ritual and the pressure I felt to get it done before anyone should find me out. And as many of you know, the pressure is intense! Society is pretty clear that not dying your hair is your fast pass ticket straight to the old folks home. Good grief! It’s no wonder making the decision to stop is so hard considering how counter-cultural and frowned upon it is. 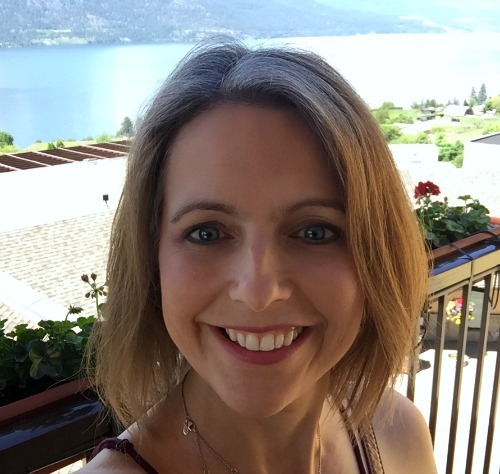 By the time December 2016 rolled around I had been living with Rheumatoid Arthritis for two years. I had completely changed my diet to manage my RA without meds. This diet is an anti-inflammatory Paleo diet without grains, legumes, gluten, dairy and refined sugar. Here I was eating a clean diet yet dumping chemicals on my head month after month. It just didn’t make sense for me anymore and it was the last push I needed to finally make the decision to quit. But oh the emotions that followed. Nervousness that I wouldn’t like the results, excited that I would, bracing myself for the backlash from others and of course just hesitant about all the unknowns involved in the process. It’s been an interesting ride these last 18 months that is for sure. First let me start by sharing some before pictures with you. The fact that I’m sharing a blog post heavy with self portraits makes me so uncomfortable (it’s all sorts of awkward, selfies are hard y’all!) but in order for this post to tell my story, I realize it has to be done. So here goes. The first photos show my before and after and then I’ll share some of the transition pictures as we go along. This picture is from 2012. I dyed my hair this color for years. In 2016 I went a little lighter. This picture was taken in November 2016 right before making the big decision. And here I am in 2018 almost fully transitioned. I remember that January day in 2017 when I walked into my bible study group and declared to the ladies that I was no longer going to be dying my hair. There were audible gasps around the room followed by a lot of questions and uncertainty. I explained my reasoning as best as I could. I was tired of conforming to society’s standard of beauty and being told that forty was way too young to let those gray hairs shine. I was tired of the chemicals and the monthly commitment and frankly being told what to do. I was just done and wanted off the hamster wheel. What did my real hair look like? No one knew. I told myself and my friends that if I didn’t like it I would dye it again but I wanted to give it a go. It felt very scary. But that day, surrounded by a large group of woman, one of my girlfriends bravely stepped up and said to me, “I’m going to do it with you too”. And all of a sudden it didn’t seem quite as scary anymore. My girlfriend has stuck it out with me and now she too has a gorgeous head of silver sparkles. I knew the process would be hard but I guess I thought it would be a little easier than it was. Oh my goodness, transitioning to gray hair was a slow and not so lovely process to endure. Short of cutting a pixie cut, which was something I wasn’t prepared to do, I just had to sit back and wait for the skunk line to slowly creep its way down my head. Yes it was exciting to see the gray color finally start to reveal its true shade, but the contrast between the old color and the new was a lot to take some days. These next two pictures are 6 months in. It never seems as gray to me in person until I see a photo of myself and have to do a double take. By the 6 month mark I think people really started to figure out what I was up to. Not one to love attention, I felt very exposed. Ladies were just genuinely curious (and surprised!) as to why I was doing it and couldn’t help but ask me about it. Even random strangers would stop me to ask about my hair. It definitely took some getting used to that is for sure, I often felt like a lion on display at the zoo! Most ladies were very encouraging yet there were others of course that thought I was totally crazy. Thankfully, for the most part, I was able to let the naysayer comments just roll off my back and not bother me. At this point the brown was starting to fade but was still noticeable. 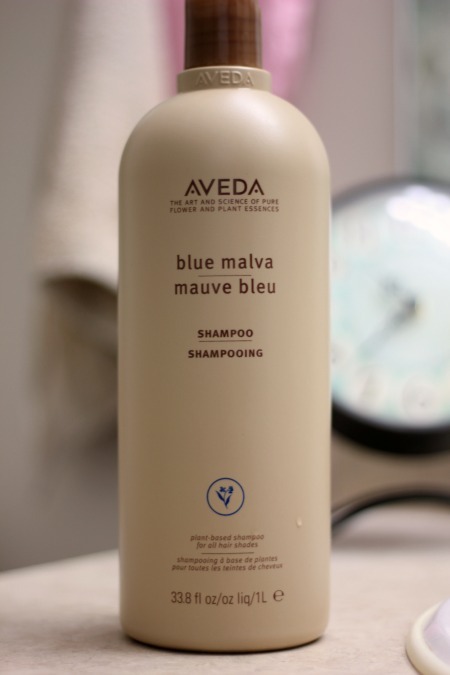 My girlfriend bought me this Aveda Blue Malva Shampoo (affiliate link) and it really did (and does) make a huge difference with manageability. It keeps the grays soft and shiny while keeping the brassiness down on the brown. I highly recommend it and though it’s expensive, a little goes a long way! In addition to using the above shampoo I also had my hairdresser apply a toner to the bottom half of my hair at this time. As you can see this helped immensely to tone down the brown color and make the contrast of the two colors a little less obvious. The toner isn’t permanent though and after a couple of months the brown gradually reappeared. I had the toner done a few times and I always felt so much better without the obvious line. If I had known it was an option I may have started doing it sooner. Other options are hats and head scarfs of course but I never really felt those looked good on me. The problem with gray hair is it can wash you out if you let it. It became clear to me that my makeup and clothing choices needed to be an important part of this process. I still wanted to feel pretty and alive and the gray clothing that lined my closet wasn’t cutting it anymore. Apparently I really loved gray clothing because I owned a lot of it. I’m slowly trying to incorporate brighter colors into my wardrobe as I can afford to. I continue to play around with makeup to add color to my face and bring out my eyes. And while you can’t tell in these particular pictures, I’ve also been trying to go brighter with my lipstick to perk me up and feel a little less drab. This one surprised me the most. I wrongly believed the lies that with gray hair I’d automatically feel old. Like the two would just naturally go together like bacon and eggs. Every day I’d wake up and wonder if overnight it had finally happened lol. 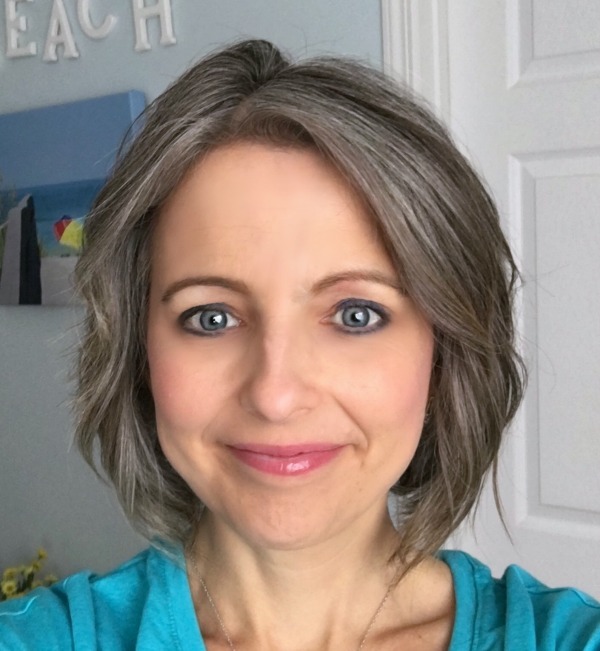 The emotions I went through in anticipation of what was to come with transitioning to gray hair were strong and all over the place. It takes awhile to adjust to the person you see in the mirror everyday but eventually I realized it’s still me. The same person I’ve always been. My goofy, crazy personality wasn’t going anywhere. What I’ve learned is that gray hair is simply a color, nothing more. It only dictates what we let it dictate. I’ve always encouraged my kids to dare to be different, to be leaders and not followers. And what was I doing with my hair? Totally being a follower because culture dictates that I hide the natural beauty that God so beautifully bestowed upon me. Nope now I can stand proud and tell them that I’m practicing what I preach. That I’m brave enough to stand apart from the crowd and it’s okay. I’m okay. My world hasn’t fallen apart. That feels really really great. And then finally one more taken just today. See how it looks different in different lights? If this is something you’ve been thinking about doing, I hope this post encourages you to just go for it! 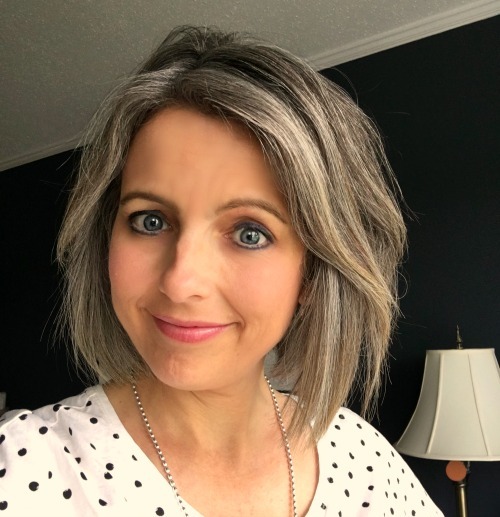 I’ve literally studied hundreds of before and after pictures (as part of the Gray and Proud Facebook group I’m in) of gray hair transitions and can sincerely tell you that all these ladies look so much better in their after pictures. The uniqueness I see in the variations of gray/white/silver coloring is simply stunning. Plus as we age our skin tone changes so the lighter grayer hair just naturally looks better. I feel no shame in my gray hair game. Only confidence that I made the right choice for me and can proudly stand firm in that decision regardless of what anyone else thinks. That alone is so very freeing for me especially considering that by publishing this post the possibility for judgement is there. Eeek! Whether you dye your hair or not, confident women are beautiful women so be bold and brave in whatever you choose! 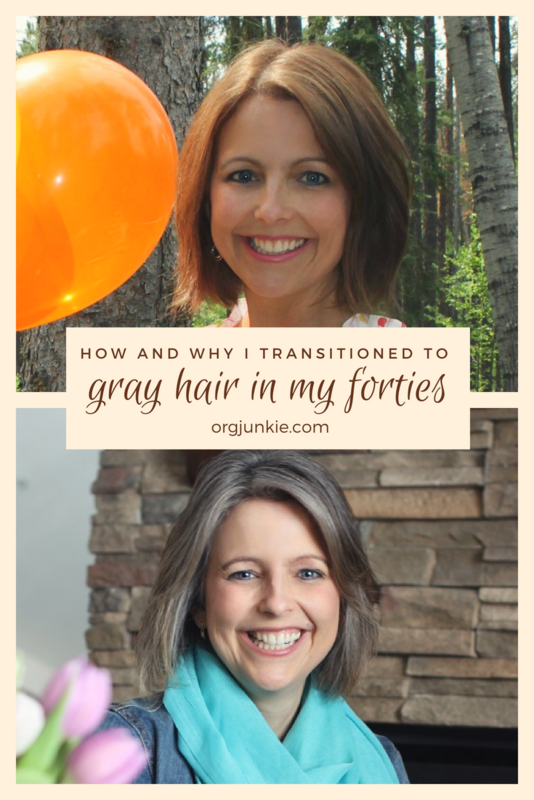 If you’ve got any questions about the transitioning to gray process, please leave them for me in the comments. I’d be happy to try and answer them. I’m not sure how I ended up here, but just wanted to say how great this is. Firstly you look amazing! And I know it’s really difficult with so much pressure on us all to continue to meet society’s ridiculous expectations, but the more of us that do it, the easier it’ll become. I applaud both your bravery and your elegance! I am also in process of transitioning to gray from dying my hair black since 18 yrs old …. 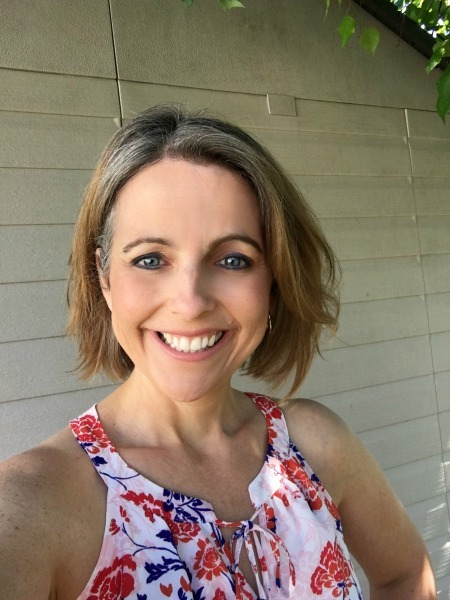 I will be 42 in 4 months … I am excited and your blog just gave me an extra boost and confidence to know that I am doing that right thing for me … want to say Thank You !! I have been debating this because, even with touch ups every 4 weeks, the roots are so awful before I go get a retouch. It is a really scary idea though! I go for a coloring today and will talk to my hairdresser this morning about what she thinks. Would you share your Facebook group, either publicly or in a private message with me? Thanks for the encouragement! I have been thinking about going natural for a while now also but am terrified of the transition process! I would also like to know more about the Facebook group if possible. Hi Kelly, the transition process while hard wasn’t as bad for me as it could have been and I think that’s because I did start so early before I was more white on top. Just another reason transitioning early is a good idea! 🙂 The Facebook group is called Gray and Proud. Hi Debbi, the Facebook group is called Gray and Proud. It’s such an inspiring space of brave woman sharing their transitions. You will be inspired for sure! I’m still in the growing-out phase but going natural was the best thing I’ve done for myself in quite a while! Wow, this was just what I needed today. I’ve been thinking about it. My mom still colors her hair at 70…so I’m a little scared. I do remember how beautiful my grandma’s white hair was. I’ve colored since in my 20s as well. I have no idea what color I would end up with. Thanks for your courage in sharing your story. I will look for that facebook group. 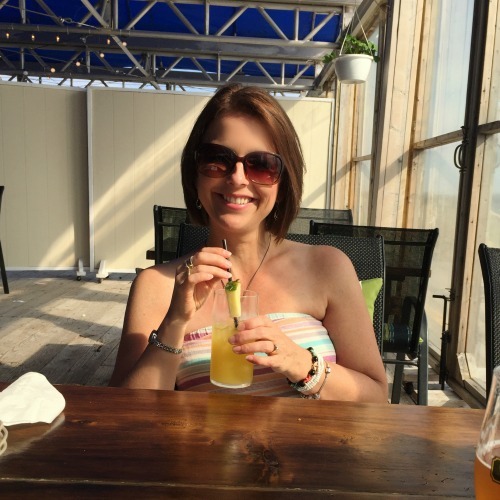 It has helped with the keto diet – maybe I’ll take this step toward naturally me. It would be such a relief. Hi Melissa, the Facebook group is called Gray and Proud. It’s very inspiring!! I went natural about 2 years ago, and haven’t looked back. While some say I look older, others love the streaks of white and gray color, and still some dark brown( I am not as young as you -67). I’ve had far more compliments than negative responses. I have noticed that the colors that look best on me has changed. I had brown hair and a peachy skin tone, so wore lots of peach, green, brown, yellow, orange. Now gray, black, violets, reds are colors I can wear, and yellow, peach, and brown are not as flattering. I have darkened my lipstick, because as you said, you do tend to look washed out without it. That’s awesome Judy! Yes I totally wasn’t expecting the colors I wear to make such an impact but they really do. Laura, your hair is beautiful! It really does make me wonder what my hair even looks like beneath this color. The time and money spent (and chemicals absorbed)… why am I doing it? Thank you for making me think! Yay, this comment alone makes me so glad I got up the courage to share this post. Thank you for that Andrea! I am so glad you made the choice to be you! I think you look great with your natural color. I went gray in my early 20’s (straight down the middle only for a few years). I tried coloring once and the smell made me extremely sick (I was pregnant at the time might be why) but I never did it again. Over the years I have now become white headed. I love how it looks and get tons of comments about how white it is, I’m happy for you! When did you decide to let it out. I’m 27 and coloring my grays every 4 weeks! Went blonde from brown to hide better between colorings. I thought maybe I could learn to embrace it but can’t help thinking I’m not going to be able to hold out and commit. HELP! 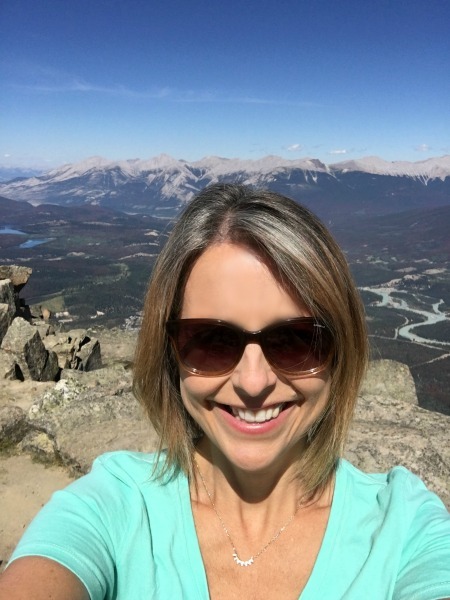 I decided to stop dying at 45 but now that I’m on the other side I wish I had done it sooner! You look gorgeous! I have been coloring my hair for years, with the excuse that the color adds volume. I have a hair appointment this afternoon, and I now plan to discuss working my way back to natural (whatever that is – I have no idea anymore!). Thanks for the push i needed and for sharing your story. Thanks Susan!! The Aveda Shampoo seems to help with volume too, it really is amazing stuff! I know it is COMPLETELY different for men, but my hubby’s hair was gray in his late teens/early twenties, and I’ve always asked him not to color it. And, I think your hair is absolutely gorgeous!!! The contrast is just perfect!!! :))) Just like Morgan’s, my DH. I think it’s great that you are celebrating what God has given you. Thank you Joy, it’s been a time of growing for sure, mentally and physically!! Knowing what I know now I do wish I’d been brave enough to do it sooner which is why it was so important for me to share this post. I love your new hair!! You’re beautiful! Great blog post. Thank you, thank you!!! It’s scary to put yourself out there (especially as an introvert!) but I really think it’s such an important topic to discuss. Hopefully this opens up that dialogue. Thank you Debra for your encouragement, I appreciate it!! You look amazing, fantastic, wonderful, beautiful and on & on & on. Way to go girl! Oh wow Jen, you sure know how to make a girl feel good! 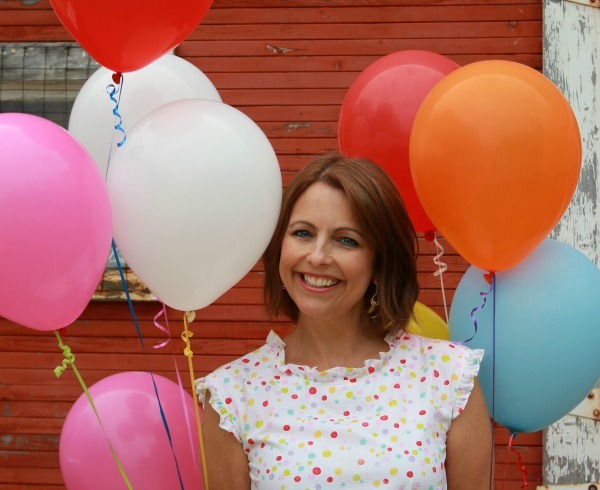 I was so nervous to hit publish, in fact I had it done last week and just couldn’t do it. I wish the pictures were better but when I started transitioning I never thought one day I’d make a blog post about it lol. Have a great day girl! I agree with everyone else, you look great. My hair dresser once told me that grey hair was ” God given highlights “. It really is so fun now to be on the other side of the grow out and am so glad I hung in there! Thanks for sharing your story! You are very beautiful and that’s why you mustn’t be worried at all ; the first thing I see when I watch your photos is a pretty woman, a smiling and happy face, I mean a genuine smile, the one that goes up to your eyes and it’s great !!!!!!!!!!! What a kind thing to say, you have blessed me with your thoughtful comment. Thank you!!!! Thank you for sharing. I have considered not coloring my hair, not sure I am brave enough. Thank you for the information. You’re welcome Christine! Yes it’s definitely a very personal decision to make for sure. Laura, your hair is stunning! I am starting to get gray “highlights” and have been debating whether to color or not. Thanks to your encouragement, I will resist the pressure and remain natural! I so enjoyed reading your post, and I think your gray is beautiful. I colored my hair one time, over 20 years ago when I started to go gray. I’ve never liked the uniform look of Home-dyeing, so didn’t want to continue. Thinking about how this is how God designed us, and how gray hair is esteemed in the Bible, I decided to go natural. One of my friends has since done the same, and there are several ladies at church who did what you did, making a transition. They all look lovely! It is so nice to see people loooking the way they really are! Congratulations and thank you for being brave, posting all your personal photos. I have a feeling you’re going to help a lot of women do the same! Thank you Jean, yes it was terrifying. I kept putting it off thinking I’d wait until I had professional pictures done but those weren’t happening and then finally I decided I just needed to go for it. You look SO pretty with your natural hair color! I transitioned away from coloring my hair about ten years ago, and I’ve never regretted it. If God wanted me to have brown hair into my 50s, he would have given it to me. Yes that’s how I feel, wish I’d done it sooner!! I decided about three years ago to quit coloring and let my gray shine through. Your hair looks gorgeous, and really complements your eye color. You look beautiful! I am wanting to transition back to my natural color, but fear the transition will be a little more difficult. My “gray” hair is more on the blonde side, so the transition will really show. My current color is Light Amber Brown. Do you think that doing the toner would help? I think so, definitely something to consider. Talk to your hair dresser about it for sure. Good luck! I swear I see signs everywhere telling me to stop coloring my hair! I have been thinking about it for awhile and also lurking every day on the Gray and Proud page. Now I get on your site and lo and behold—more inspiration! Thank you for another positive story. It may just give me the courage I need! Oh wow isn’t that crazy. The first couple of months are the hardest for sure. Good luck! It’s beautiful! I waited until I was sixty (5 years ago) to stop coloring my hair. It is scary to take the plunge, but I’m so glad I did. I feel the same as you…my Father gave me this color hair and there is no need to cover it simply because society says I should. Your hair looks great, it would cost big money to pay for all those “highlights!” I transitioned at a couple years ago at 55. I wish I had done it sooner. Men frequently men compliment me and say they wish their wives would quit coloring. Great post! Isn’t that interesting Linda about the men. So fun to see so many silver sisters commenting! Wonderful post–thank you! I’m 56. I found my first gray at 21 and began coloring my hair around 23. I decided to stop about three years ago. The decision was partly based on laziness and partly on curiosity as to how much gray was really there. I wish I’d taken photos during the process as you did. I wear my hair longer–which used to be a serious faux pax for a woman my age!–and the very last of the artificial color was trimmed off a few weeks ago. I’ve made my peace with the gray. Dare I say I LOVE it?? 🙂 I’m amused when people I haven’t seen for awhile look at me and say, “Did you lighten your hair? ?” I laugh and say, “No, those are nature’s highlights!” Right now, I have some heavy streaks in the front that frame my face, so in certain light it really does look like highlights. Now I’m off the find the Gray and Proud FB group! Thanks again for prompting this conversation! The comments from others have made me laugh on occasion too especially when I see them looking and not knowing quite how to ask about it lol. I turned silver at 28, colored my hair until age 51. I love it! At first people would stare, now you see it everywhere! You are beautiful! I have never colored my hair, but have thought about it numerous times. The expense and time have held me back. Now I deal with thick, coarse silver, dark brown combination with little silver hairs that frizz like crazy. I cannot get a sleek look at all. I have tried numerous products. I don’t mind the silver, but the frizzyness drives me crazy. Do you have any recommendations for that. I have tried everything my beautician has suggested. Your hair is beautiful and doesn’t seem to frizz at all. Thanks for being real! Susie, did you see my recommendation for the Aveda Shampoo? It totally helps with frizz, I highly recommend it!! A few years ago I too had been coloring my hair for years. The stress of keeping up with roots & the time it took was getting old. Then I read an article about how you can develop an allergic reaction to hair dye at anytime. Symptoms start with an itchy head then get worse from there. I just didn’t want to take a chance I’d develop an allergic reaction. I also hated the chemicals I was putting on my head while eating organic & clean. So I decided to stop coloring my hair. I told my hairdresser who is probably 25 years younger than I am. Here reaction was priceless. She’d seen my roots before & they looked pretty white. I had no idea what color my hair was or how gray. (I was in my late 50s then.) As my hair grew out the white roots weren’t so white. I too was nervous about the outcome. But I love it! Funny side note to this is my 83 year old mom stopped coloring her hair when she saw how good my outcome was. She looked so pretty with her natural color. My hair looks very similar to yours with a little more lighter gray around the temples. People have asked me where I had it done. And like you i say God did it. That’s awesome, thanks for sharing that!! You’re an inspiration. I admire your bravery and you look fantastic. Thank you! I was hoping to get beautiful professional photos done like yours before posting but it just didn’t happen. Hopefully this summer! Beautiful! Absolutely Beautiful! Oh my – you’re such a beautiful woman! Just look at your smile – your eyes even lights up! I never like dyeing my hair and only did it once in a while. 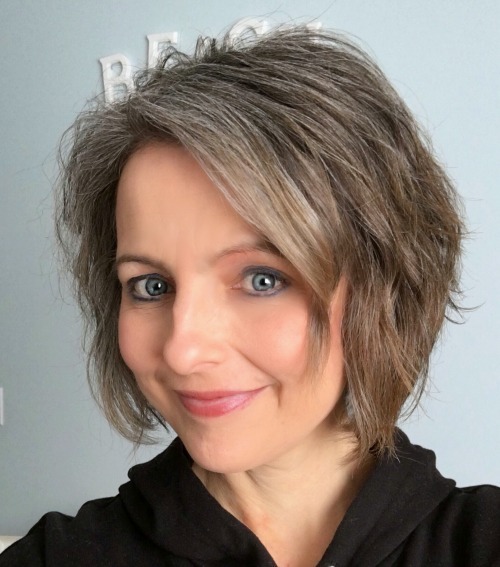 Until my teenage daughter and colleagues at work said that i should dye my hair – grey is just not the thing. Thus i started dyeing more often but everytime i was sooo concerned about the chemicals. Thus the last time i used henna which is without chemicals but had another problem on hands… when i wanted to dye again the hairdresser told me that i cannot dye with chemical dye while the henna is still in my hair – the hair will simply break off. 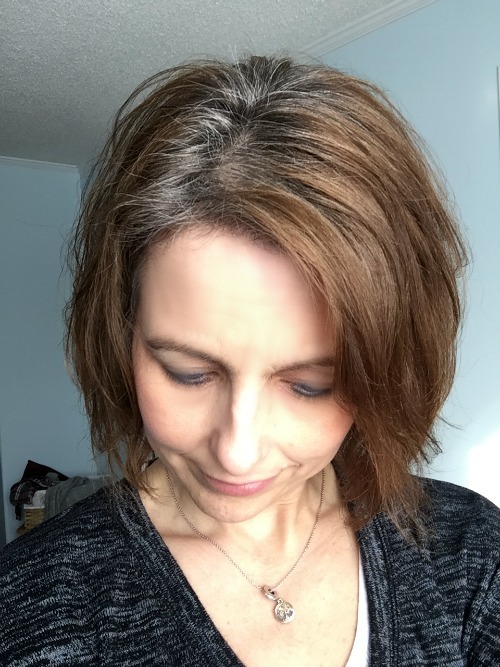 Thus i made my final choice – I’M GOING GREY no matter who said what. Never am i going to dye my hair again. Thank you for your blog… I really enjoyed reading it. Congratulations for sticking it out! Yes, we have to appreciate what our Father blessed us with and not be shy… we might just be the inspiration that somebody else need to also take her step. Oh I love this and reading how your confidence has grown little by little. I’m sure your hair looks amazing, way to go Esmarie!! I don’t even see a gray haired woman, just a pretty lady with a great smile! Well done! 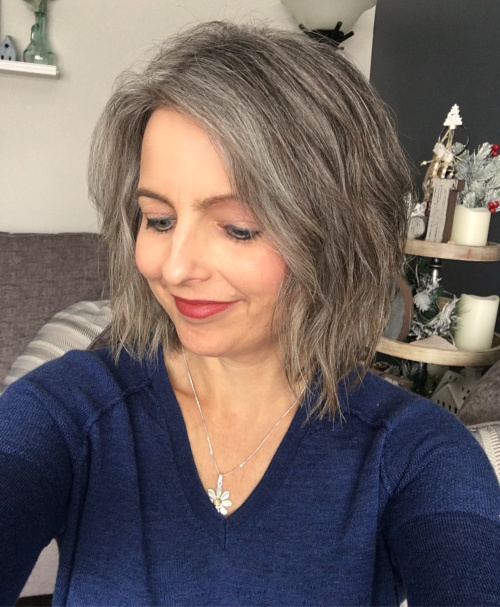 From one grey-hair to another–LOVE the grey! I ran across your blog by chance this morning. Like you, I started coloring early, then probably 15 years ago gave it up. 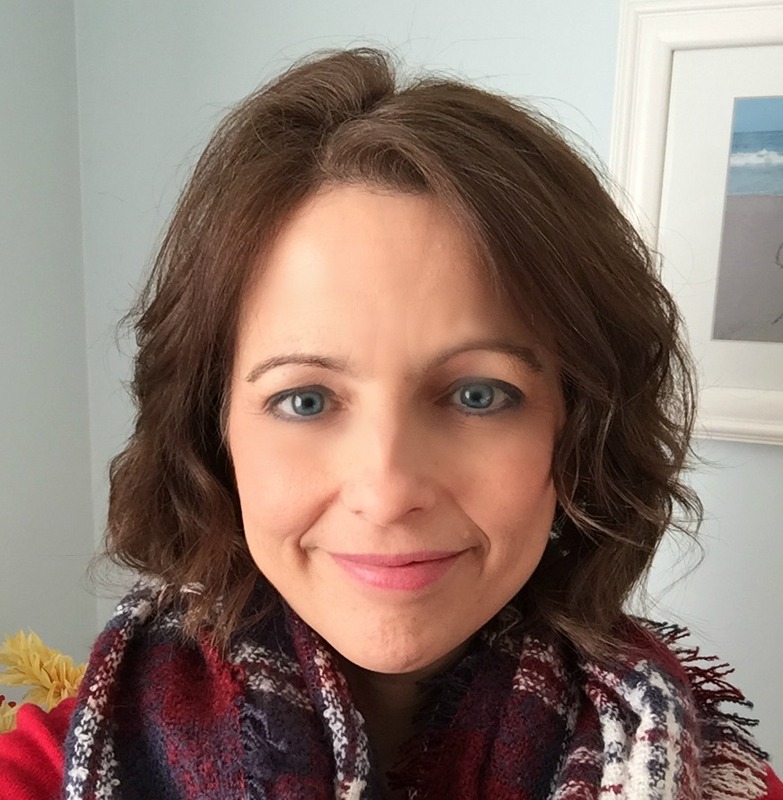 I was feeling blah and frumpy, and a year and a half ago, an opportunity came up. I started coloring my hair PURPLE. It has been a beautiful ride, and I still get compliments nearly every time I leave the house. In my mind, you look at the women who color their hair jet black, and my color isn’t any more unnatural than theirs. Plus, I work in a creative field, and my customers get it. However, my daughter is planning to get married next spring and doesn’t want her momma to have purple hair in the wedding photos. So for her, I’m letting it go. Fortunately, fashion colors fade over time and don’t take as well on the gray anyway, so I’ve got a cool ombre thing going on right now (gray and purple are natural compliments). I am very worried about how I’ll feel after letting the color go completely, since I’ve truly loved this vibrant phase of my life. I am afraid of feeling older and more “blah”, and that my inner liveliness won’t come through. Do you have any words of support? Would that FB group help me feel better? And congratulations on your own beautiful transition, I love your photos and am glad you shared your story! Love this, thanks for sharing! I think you could get really playful and fun with your makeup and clothes and still feel young with the gray. Also go with a funky hairstyle to liven things up 🙂 The FB group is so inspiring!! I too am on this journey. I will be 12 months in next month. In the last couple months I have had more people ask me about it…”are you coloring your hair differently?” It hasn’t been as difficult as I thought it would be and I do like my gray. Although, I am spending most of my days in a ponytail at this point. I may try your toner tip. I do feel like I look older. Which I have had to come to terms with. I am a new “nana”. I used to get the reaction, “your not old enough to be a grandmother!”. I don’t hear that much anymore. Although, I am old enough to be a grandmother. So, it is appropriate for me to look old enough;) Looking and embracing our age…definitely not what society preaches. You look wonderful! You make such a great point Amy, so glad to read your story. Thanks for sharing!! My mom and I were JUST having the "people will _____ (fill in the blank with whatever healthy, good for you thing) but still slather themselves in toxic chemicals, and on their head!" discussion the other day. Super inspiring, and encouragement as I work hard to NOT pluck every gray hair I see on my head. 😉 My time is coming! I’ve been colouring my hair for decades as well and, like you, began to question that decision when I started to have health issues. How could I continue to dump chemicals on my head every month when I was trying to clean up other areas of my life to mitigate my health issues?? Still it took me a couple of years to stop dying my hair because I liked how youthful I looked with brown hair and “everyone is doing it” so I felt that I would be the odd person out looking old while people older than me continue to look great because they dye their hair. Seeing your pictures has changed my attitude about this. You still look as fabulous as you ever did! I see Laura when I see your pictures. I see your beautiful eyes and fantastic smile. I see health and happiness. I see that you love and are well loved. I see that you still have your spark and you love life. I see an amazingly beautiful person. This gives me hope that perhaps when I’m through this transition, people will see me too instead of just my hair colour. Reading about your journey a few months ago inspired me to finally stop dying my hair. “If Laura can do it then so can I!” Because we are the same age and dyed our hair similar colours, your pictures have helped me visualize how my hair will look at different stages and your timeline has given me real perspective on how long this journey will take and that it won’t always be easy. My hair was quite long and I’ve had three haircuts now to go shorter to help with the transition. It’s about your length now. I’d like to go even shorter but my hairdresser hasn’t bought into me transitioning yet. I’m about three or four months into this journey and wish I had never dyed my hair in the first place. 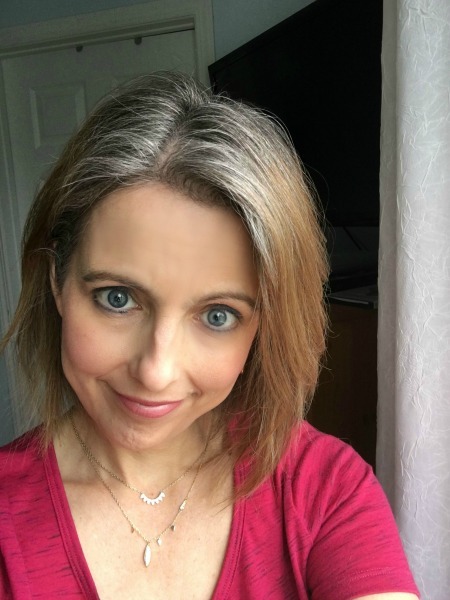 Some days seeing the greys grow in doesn’t bother me because I believe that I’m doing the best thing for my health; however, some days it bothers me a lot. I feel like people are looking at me as lazy, unkept, and “letting myself go” because everyone can see the line between the dyed hair and the natural hair colour. It helps a bit that my husband has mostly white hair (he went white before he hit 45) but I wish I had a close friend to transition with like you did. I will look up that Facebook page you recommended for additional support. What does that shampoo do? Does it take out some of the brown so the contrast isn’t so harsh or does it change the white hair to grey? Thank you so much for sharing and being an inspiration!! ??? Hey Christine! Thank you for your sweet words, such a nice thing to say. I’m so excited for you that you are doing this. You just have to get through the transition and then everything changes. Once it’s grown out then it looks like you’ve done it on purpose and you no longer feel unkempt. I totally know what you are saying. The first little while is rough but you can do it. Whenever you feel like giving up send me a message and I’ll talk you down 🙂 Sometimes that’s all you need. It does get better I promise. As for the shampoo yes it takes out some of the brown which made me feel less obvious. Plus it helps with frizzies and keeps the gray from looking yellow. It’s really great stuff. I’d just use it a couple of times a week so it really lasts a long time. Hang in there girl, you’ve got this!! LOVE your beautiful gray!!! It is such a pretty color! I decided in August 2017 to stop highlighting my hair to help hide my gray and embrace my gray. I have dark blonde hair and so bleaching it worked but I hated the time and cost. I’ve gotten many positive comments and compliments on my gray and just last month I cut my hair very short and it’s all gray and sassy. I love it! 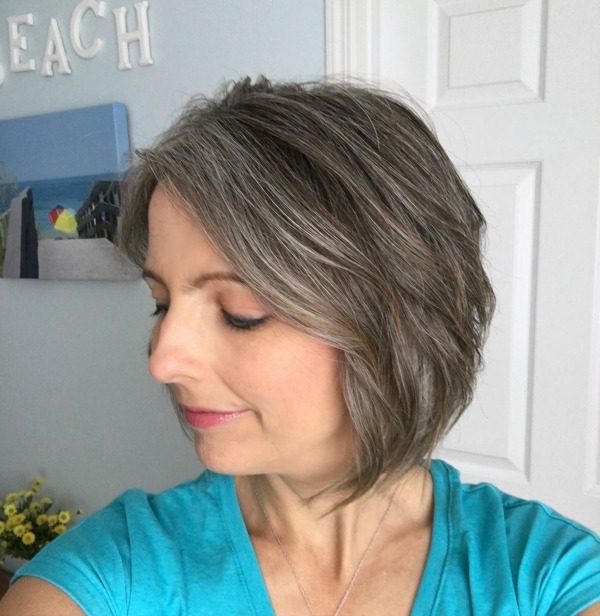 Thanks for sharing your story of embracing the gray. It’s the BEST way to go! Congrats!! Gray looks great on you! I have colored my hair off and on, not to hide gray, but just for a change. My first grays popped around 34 and I’m 42 now. I don’t have many, mostly just streaks. Anyone who asks, and especially the ladies at the salon, I tell that I’ve earned everyone of them and I’m proud of them. I have a couple female relatives who are terrified of looking old, so I’ll admit to keeping the gray just to annoy them a bit. Thank you for posting this. I have been wondering how long I can continue to afford dying my hair. My mother was totally gray at 35 years old, and was asked several times if she was my father’s mother which she hated! But she had beautiful silver gray hair. 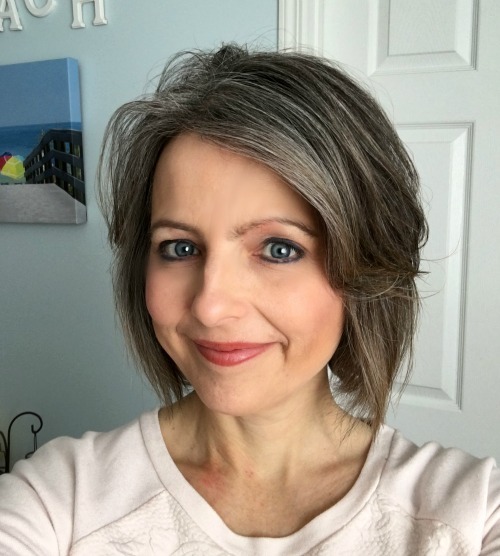 I am already older than my husband so I didn’t want to be gray until he started graying which he is now. I don’t know if I am ready or if I would even recognize myself anymore. I have been going through a transformation in my weight and have been losing my hair in great amounts which they say is normal and also temporary, but I figure I have lost about 40 percent of my once thick volume. I am a grandmother in my 60’s and should probably embrace my age but it is a very scary journey. I was also concerned about being washed out so it is very interesting to read about your needing to change the colors your wear as well as makeup or lipstick. I am seriously thinking about this. Your blog was very timely. Thank you for the courage to share it with total strangers. I sometimes would joke about getting the sparkles removed, but it may be time to let the special sparkles the Lord has provided as He shines His light on me! Yes! You can do this Marcia!! I love this comment, you don’t hear that too often 🙂 Thanks Kathy!! It is a relief to stop having to pay out every six weeks. I enjoyed your pictures of the process. As for me I had an easy route–I got breast cancer, lost all my hair with chemotherapy and just left it alone when it finally came back. And just when I wonder if I should redye it I read your blog and think, “And maybe not.” I like different colors but you’re locked in when you have a different color underneath the dye. Thanks for your post. I’m sorry to hear about your breast cancer Lorraine but glad you are doing well now. I loved how you showed the monthly progression. My mom has dyed her hair forever and I always saw her grey roots. I vowed to never do that, I haven’t dyed my hair ever and I’m 48. Yes, I have gray strands and I’m fine with my hair turning gray. I’m embracing it also and glad that you are doing the same. Loved that you have never dyed, that is awesome! What a lovely post! And I don’t just mean the hair but you certainly do look beautiful! Thank you for sharing so much about the process, not just the physical transition but the emotional one as well. It goes so much further than hair and you are a true inspiration! What a kind thing to say, thank you Amy! I stated this same journey approximately 12 months ago. My hair dresser embraced my d fusion with me and has been wonder support. She suggested the toner right off and it made a world of difference in keeping the obvious skunk line from being so very obvious. She shared my excitement as time went by and what type of gray I would become. The pixie cut idea wasn’t for me but I did make a suttle hair cut change just to give me a new feel with the new me along the way. All this being said, if you don’t have a good relationship with your hairdresser find one who will support you in your decision and work with you through this journey of the real you shining through. Oh this is such good advice, thank you for sharing it!!! Your hair is lovely and really compliments your eyes. So I did! I get lots of compliments on my hair so overall I am satisfied with nature’s color. That’s what I love to hear!!!! I too quit coloring my hair about 2 years ago. I was sick of spending the time coloring my hair only to have the gray roots showing up again in a few weeks. It was a hard decision to make and I was afraid it would make me look really old. Going through with it wasn’t fun because of the length of my hair and I didn’t want to have it cut real short. But this is probably the best time to go gray because of all the younger people coloring their hair gray and other colors, you don’t look so out of place. Now that I’m on the other side of it, I’m ok with my gray hair and it is just a color and I’m still me! Yes exactly Kathy! It’s just getting through the transition and then it’s so much better! You look great! Using bright, colorful scarves with your existing clothes will help keep you from breaking the bank. I made the decision to stop coloring my hair at least ten years ago. My Mom was battling a type of cancer that can be hereditary and I was fighting my own health issues as well. One day I thought, “Why am I putting these chemicals INCHES from my brain? That’s crazy!” Friends and colleagues asked me why I was letting my hair go gray and I replied that each strand signified a battle I won. They were my badges of courage and I had earned every one of them. My husband now says he likes my hair better this way. Oh I love that so much Nina, great attitude! Gray looks great on you! Also, you take great selfies!! ? You are too kind Jodi, thank you!! Good for you. I also began going gray in my 20’s. I made the choice not to color. I would have had to touch up roots at least once a week. I did not have the money to do that nor did I want to waste that much time.I felt it was what God gave me,so I embraced it. I also let my hair go gray. I was so over having to color it every 4 weeks, plus the cost and damage to my hair. Now my hair is shiny and healthy looking. I get a lot of compliments on it. However, I still have days when I think – man I need to color my hair. First time commenter here, though I’ve been reading your blog for a while. I just have to say, you look great with your natural color! You look more “you” than ever! 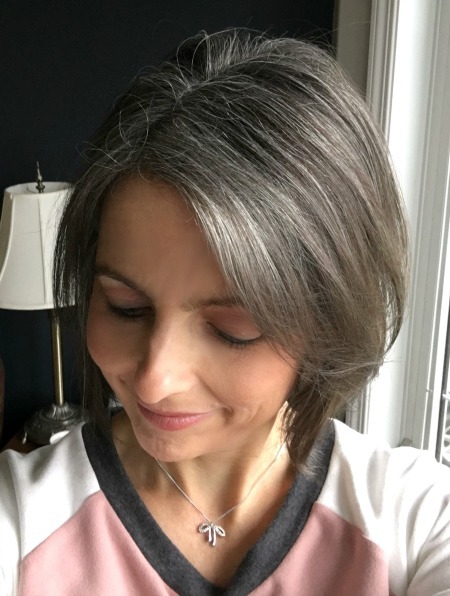 At 47, I don’t dye my hair (and really never have except for highlights back in high school days), and I call my gray hairs “silver sparkles” too. I think gray hair is beautiful. High five to that Lisa!! Thanks for taking the time to comment, I love hearing from my readers!! 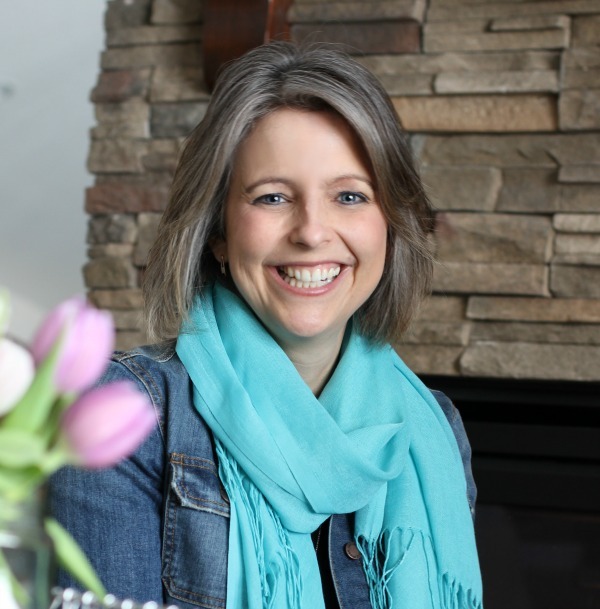 I was following a link (really need to organize our home in many ways) and happened upon this gray hair story instead. Very encouraging to read your process and positive results. My mom and several aunts grayed early (all but one hide it with dye) so I knew my fate! My dark brown/black shade became peppered before age 40. I had two of our four babies AFTER those strands changed–still hard to hear people ask if they are my GRANDkids. And it bothered my resolve when stylists nudged me to let them color it (I do get occasional perms to give wave to the thin strands). I chose to live with what God gave me, and didn’t want the expense or mess of keeping up frequent coloring, and fear of how to ever transition later. My whole head is very silvery gray/white now at 55. I do look older than my “dyeing” peers–that is hard sometimes at social settings to feel alone in this choice. BUT I’m supported by my husband, who has also grayed at the same pace! Your post and the comments from others is very encouraging. I love wearing purples, blues, teal, but must follow your lead to brighten up lipstick and be alert to the colors nearest my face and hair! Such a great attitude Janet, good for you!! I’m so happy to see more and more women ditching the hair dye. Your natural hair is so pretty! I am only 4 months into my transition, and have been frustrated at times, but reading blogs like yours are really inspirational! It was just what I needed to read to stay focused. Thank you for sharing! Yay, so glad to hear about another silver sister! Hang in there, it is tough but so worth it. 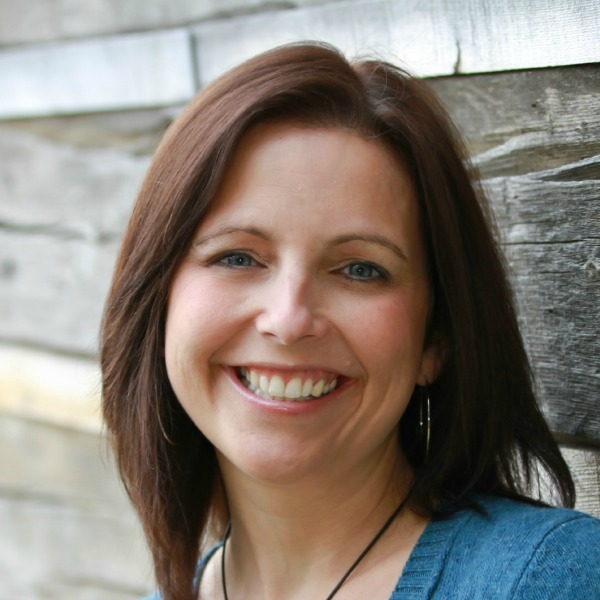 What an inspiring and motivating story, especially, for us gals still on the fence. I had a family member put me to shame about my dark hair color a few years before the gray arrived & I have been hitting the colors ever since. Your hair looks fabulous. It compliments your skin tone. I appreciate you mentioning that there are ways we can enhance our look by choosing the right colors in clothes and make-up that would brighten our appearance. I think in months 2-3 its hard to get a feel of what it will look like if you have gray that is scattered though out the hair. Now that I approaching 47, I know its time to embrace the natural color God has given me. Oh I’m so glad to share because it’s been so freeing for me. And I agree, when you really have no idea what your grey will look like the unknown can be scary. Not to mention you feel a little frumpy. But if you can get through it you will feel amazing and pretty when it’s done!!! I’m so glad I read your story. I’ve been thinking about letting my gray grow out. I’m 47 and i think I’m ready ? As a man, I applaud you for going natural. I hate the fact that our society makes women think that they need makeup and hair coloring to be beautiful. God doesn’t make mistakes. Let your natural beauty shine through. That being said, I do have one gripe with your post. Why mention “the beauty that God so beautifully bestowed upon” you, but then wear makeup to cover up that beauty? Thanks for the blog. Keep up the good work. Thanks for your comment Jim and yes you make an excellent point. I’m not sure I can give up makeup but I never thought I’d have the courage to not color my hair either. So you never know!! has anybody tried using wigs to get through the transition? I’ve heard they can be harmful to hair but not sure if that’s a fact. My mom wears one all the time and does well with them but she’s 78. 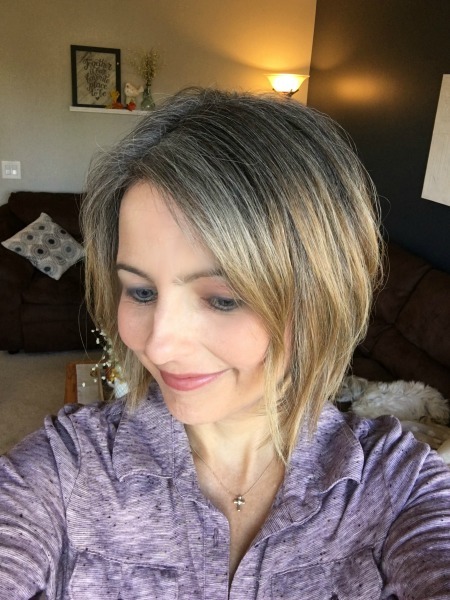 I was thinking about starting with one that’s a little lighter than my hair color with gray mixed in then gradually getting more gray over time. Any comments from anyone who’s tried it? natural is best all around. good job. 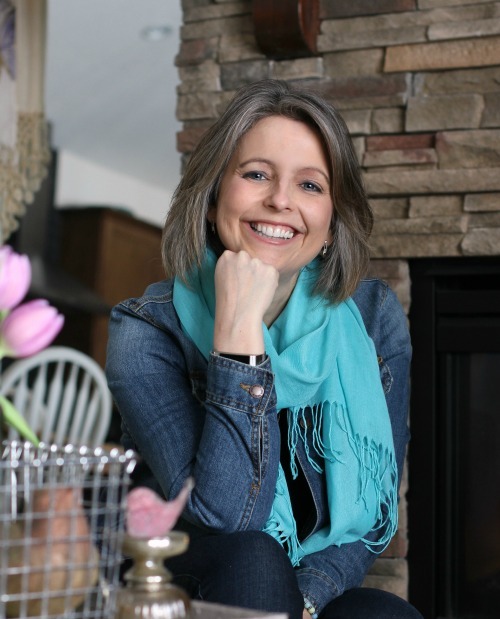 Laura, thank you for your courage and for sharing your journey! I am 72 and have been coloring my hair since my mid-forties. No one in my family wants me to go gray because they believe I will look older. I probably will, at my age, but I am weary of the monthly routine, leery of the chemicals, not to mention the cost. Your hair is so pretty, before and especially after, and the style is beautiful. Ahhh Linda, I’m so glad! I was so uncomfortable posting selfies of myself but I wanted to do it to help others. It makes me so happy to know I am, thank you!!! Im going on 2 months dye free . Its scary , but with the support of my FB group its not so bad. Im getting some flak from a few people I know but they think Im too young to do this until I tell them Im 63 . Well anyway . Im excited and cant wait .to see the end result. I did try on a few wigs but they dont look right on me . I have a lot of hair . I did find a cute wide crochet headband that looks good. Hats not so much . Baseball caps look ok . I use Wow powder for the sides. Not cutting my hair so I wear it in a pony most times . My son says it looks cool . thats what I like to hear!! Yours looks really great! I like it better than the dyed pic. You are pretty either way ! Rock on girl! Thanks Marilyn! I just added the two last pictures today so that was good timing to visit this post 🙂 Hang in there, the grow out is so hard but once it’s done you will feel and look amazing!! What an inspiring story! I’m in my 10th month of transitioning to gray hair and I’m doing it the cold turkey route. I’m 51 and wish I had started sooner. I love my natural color and I love not wasting time and money at the salon every month. I think you are setting a great example for your kids. 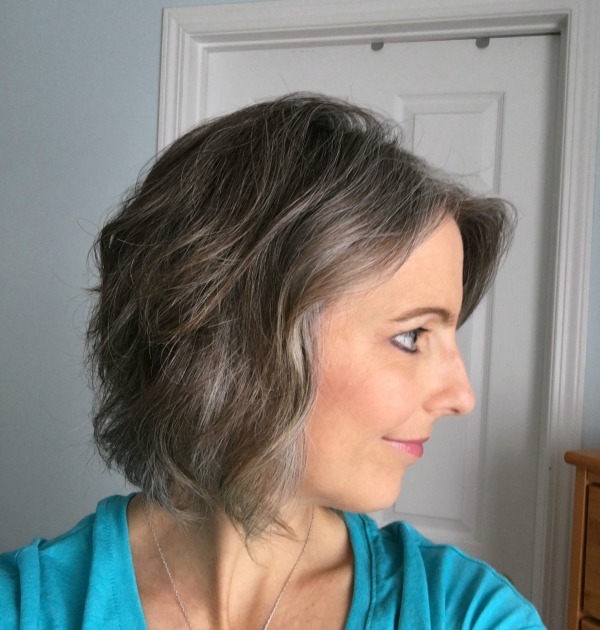 Since the gray hair movement is picking up steam, I hope that the stigma against gray hair will eventually go away. 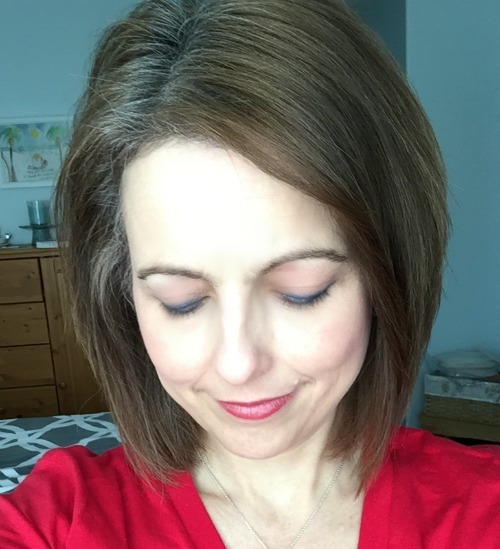 I started a blog about my experience going gray, and share other women’s experiences there, too. Would love it if you stopped by! Wow this is just what I needed to not feel so alone and get the validation that nobody else in my life will offer. I have so much joy in my heart that shines through I can’t imagine that grey hair will change that or that somehow my value and worth as a person in my loved ones lives is bc of my brown hair. You are not alone. Let your true light shine bright!! I wanted to stop dyeing my hair dark brown in my 50s but was made to feel like I can’t do that, it will make me look old. I felt disappointed, it seemed like other people had control over my hair until one day when I turned 60. I thought, I’m not young so why should I keep fighting trying to look younger. What kind of younger? At 60 I decided I’m done. I began to take very good care of my skin and wear a little makeup. Today I get so many more compliments than I ever did when I colored my hair. I don’t look older I look better. Not to mention, my natural hair is lighter silver around my crown and salt and pepper around my face, the opposite of what I usually see but it’s silver and charcoal (it was almost black when I was younger) I do not have any brown cast to my hair yet I was dyeing it brunette so it looks so much better now. I think gray hair is beautiful and I compliment women all the time. A good haircut/hairstyle is very important also. You look much better with your natural color it compliments your eye color. 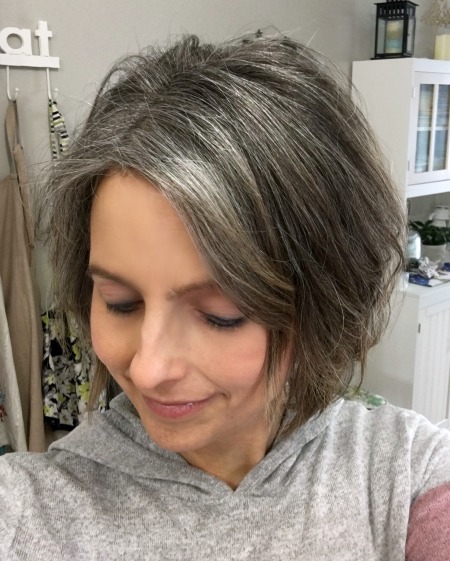 About gray, there are cool grays and warm grays so you have to pick the gray that matches your gray hair whether it be cool or warm toned. I’m so happy for you that you decided to embrace your natural color. I’m sure it looks absolutely amazing on you! Love your hair and I am in the middle of the same process; however I have been adding low-lights in to help. I am considering the toner and wondered what brand and shade of toner you used? Thanks Jennifer! My hairdresser did it so I’m not sure about what brand it was. However I’ll try and remember to ask next time I go in for a trim. I will hit the 2 year mark of growing it out next month and I love it! It was a surprise that I had white hair surrounding my face, not the silver I expected. It’s starting to come in all over now but the variation of natural color has been fun. I’m glad the hard part is over. Your hair is beautiful, just perfect! Thank you for sharing your beautiful journey. I’m less than two months away from turning 40 and strongly considering to transition to my natural gray. Your story has inspired me. Oh that’s so great to hear Erin! Thanks for sharing your hair journey with us. I have naturally curly hair and I have been dying it blond and flat ironing it forever! 3 weeks ago I decided to let my curls free – cut 4 inches off the length and I am slowly adjusting to “the curly girl method”. A few days ago I decided that I wanted to transition to my natural colour and let my grey shine through. I am very nervous but at the same time excited to see what’s underneath my bottle blond. Your hair colour is gorgeous! Thank you so much Sheri! I too have pretty curly hair but I’ve never been able to let it go free because it’s all over the place and frizzy. I may have to look into the curly girl method a little more. I’ve heard others mention it before as well. I love your real hair color, it looks so natural and matches your eyes! I too am getting on the paleo diet for my arthritis ? Thank you Dee! I hope you find the diet to be as helpful as I did. The first couple of weeks are the hardest for sure. Good luck!! Thank you for such a great description of the process! 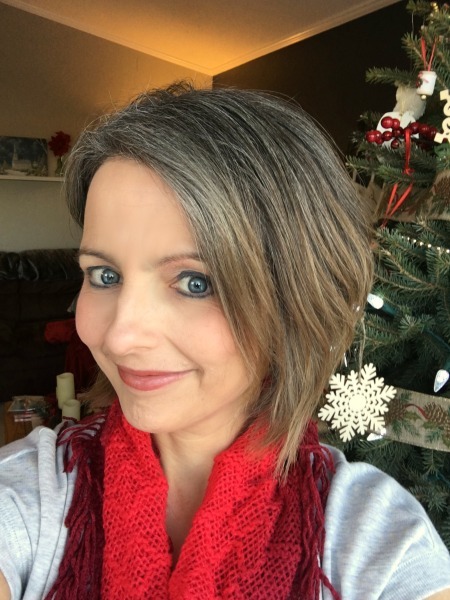 I started going gray when I was pregnant with my third child, and I have been coloring it ever since. Lately I have been questioning the sense of using chemicals in regards to my autoimmune conditions. I am currently two appointments overdue because I had shingles on my scalp, and my roots are showing me I have a skunk streak like my grandmother, which I always admired. I think I’m going to go for it! I’ll ask my hairdresser about the toning, thanks for the tip!! Yay, you’ve got this Andrea!!! Beautiful!! I’m actually 33 and after having a miscarriage in December, I’ve stopped dying my hair. Similar to you, I’m just trying to clean up my body and figured stopping the dye would be a good start. Cheers to the trailblazers!! Thanks so much for posting this! It really is encouraging. I just turned 40 and got my first grays in high school. I’ve been coloring since my 20’s and I am really just tired of going every five or six weeks to get it colored. And then only having a couple of weeks before I need to start using a root cover stick to cover the new growth! It really seems kind of ridiculous! I have have some apprehension about going natural but reading this makes me think I can totally do it.